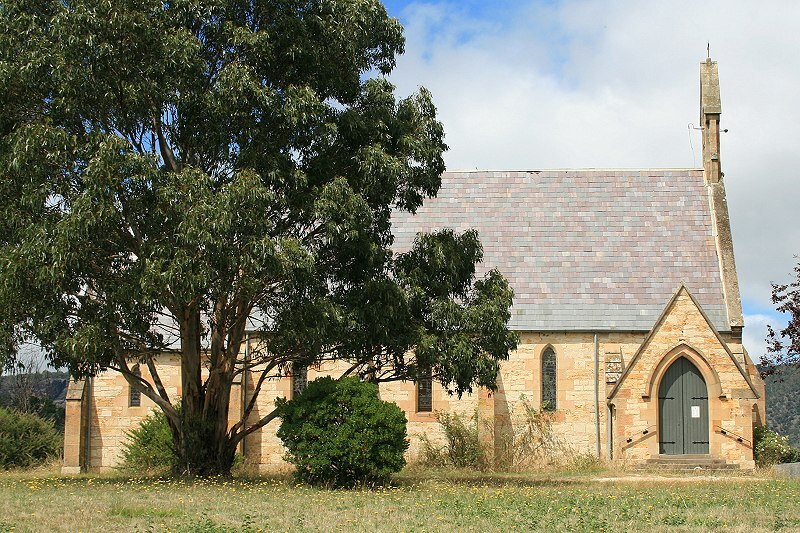 The church was built from locally quarried limestone and designed by Michael Lattin. The foundation stone was laid on 7 March 1886. The Government of the day gave a grant of 11 acres, including 5 acres for the cemetery. A feature of the church are the magnificent stained glass windows. At Fingal the members of the Church of England have determined upon the erection of a new church, according to plans and specifications prepared by Mr. Hunter. FINGAL. (From our own Correspondent.) March 7. 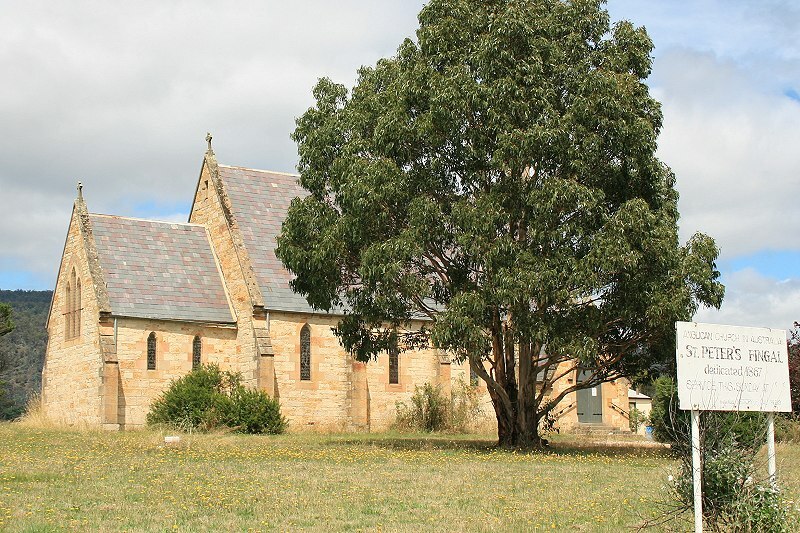 I have the pleasure to inform you that the foundation stone of our new church on this township will be laid to-day at three o’clock, by the Venerable Thomas Reibey, Archdeacon of Launceston. It is intended to have a tea meeting at the stores of Mr. Carter, kindly lent by him for that purpose, where the good ladies of Fingal will no doubt exert them selves to the utmost to further the interests of the new church. I am not sufficiently learned in matters architectural to fully describe the beauties of the edifice ; but when completed it will undoubtedly form a most attractive feature in the pretty township of Fingal. The stone is very durable and beautiful in appearance, and the builders are evidently well skilled in their trade and desirous of fulfilling their task with credit to them selves and satisfaction to the public of Fingal. The Rev. Mr. Chambers, Mr. Carter, and Mr. Clerk are the managing committee, and are constant in their endeavors to facilitate the erection of that which is greatly required at Fingal–a commodious and substantial church. On 7th instant the foundation stone of St. Peter’s Church, Fingal, was laid by the Venerable Thomas Reibey, Archdeacon of Launceston, assisted by the Revds. John Chambers, of Fingal, and W. Richardson, of Avoca. The ceremony was of a very interesting character, and attended by a most respectable and numerous congregation. A sum of £10 15s was laid upon the stone which together with the money realised at the tea-meetings and other subscriptions will give a total of £31 in aid of the church. On Thursday, 20th August, the very interesting and gratifying ceremony of licensing the new church of St. Peter’s, at Fingal, was duly gone through by the Venerable Archdeacon Reibey, in the presence of a large and highly respectable congregation numbering 180 persons. The service was conducted by the Rev. John Chambers, and the sermon preached by the Arch deacon, who referred in appropriate and eloquent terms to the decoration of the temples of the Jews to the honor and glory of God. He also said that he thought that the house of God should be made attractive to worshippers, and that all should willingly and anxiously make great personal and pecuniary sacrifices in the completion of the beautiful building in which he was then speaking. The Archdeacon wished to impress an his bearers how necessary it was that they should be able to assemble together in appropriate and well furnished churches so that we might be able to show by our presence our love for God and His works, and above all that we desired to erect a suitable temple or house of God as an act of homage to His universal goodness and loving kindness to all men. The Archdeacon especially exhorted all to give liberally as they would give to God, and there would be the intense satisfaction to every giver, however small his gift, that he had helped to raise and support a house devoted to the worship and glorification of the God of All. In the afternoon a dinner, provided by Mr. W. Duncan at the Tasmanian Hotel, was given to the Venerable Archdeacon Reibey. The chair was taken by Robert Clerk, Esq, Warden, having on his right the Archdeacon, and on his left the Rev. John Chambers. The vice-chair was filled by J. Grant, Esq. After dinner the chairman rose and proposed the health of Archdeacon Reibey, who, he said, had for the second time come to Fingal to help us. The first time being to lay the foundation stone, and on the present occasion to license the church. He had known the Archdeacon for many years, and he could testify to the great interest he took in all matters pertaining to his office, and that for the last 20 years he had worked zealously and unremittingly for the good of his church without resolving or desiring any pecuniary remuneration. He had to thank him most sincerely for his attendance at Fingal to license our church, and he trusted that that would not be the last time that they should receive his valuable aid and support. The toast was gladly responded to with cheers, and the Venerable Archdeacon replied to the toast in a most interesting and kindly speech, referring in glowing terms to the beautiful church he had licensed, and its attractive position. He exhorted all to join earnestly in completing the building, so that there might be no impediment to public worship, and he concluded by referring in the most feeling terms to the lamented decease of Sir Richard Dry, saying that Sir Richard, whether in the society of the highest or the humblest in the land, or whether by the bedside of the sick, was the same kind, attentive, and staunch friend which could, in the mind of the Archdeacon, arise alone from Sir Richard’s universal benevolence. The Chairman then proposed the health of the Rev. Mr. Chambers, which was cordially received, and he referred to the anxiety, trouble, and difficulties Mr. Chambers had undergone; but that by the exercise of a strong feeling of faith he had at last been able to say that we at Fingal were no longer without a suitable place of public worship. Mr. Chambers replied with best thanks for the kindness of those present, and said that he should not like to undertake the building of another church, and that no one who had not been tried, could for a moment understand the trials and difficulties which beset the building committee. That a sum of more than £600 had been subscribed by the people of the district towards the building of the church, which up to the present time had cost about £1,070. He also said that some thought that contracts should have been entered into instead of employing labor as had been done, but it was impossible to call for tenders when they were not in a position to accept them, not having sufficient funds; when, on the other hand, if funds failed them they could stop the works without detriment to any one. He was now much gratified that at last the new church had attained so near to completion as to permit of its occupation for public worship. He was grateful to all for the support he had received, and trusted that many who neglected to attend the old building would regularly attend the beautiful House of God which had just been licensed at Fingal. The dinner was good and carefully provided, but the comfort of those present was materially interfered with by certain hilarious demonstrations in a room adjoining. 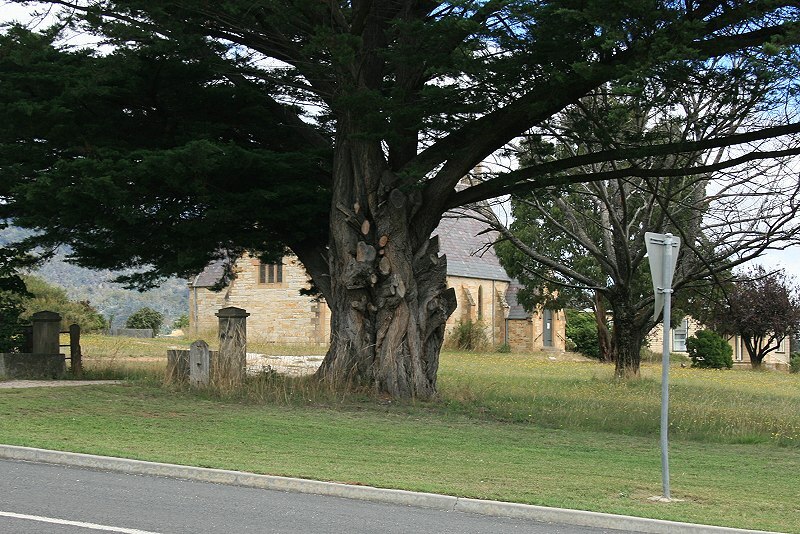 This entry was posted in Church: Anglican, Fingal by Monissa Whiteley. Bookmark the permalink. I was a resident of Fingal from 1973 till 1996 and a regular communicant and musician at St. Peter’s. On my last visit back in 2013-14 I was so disappointed to see it in disrepair. 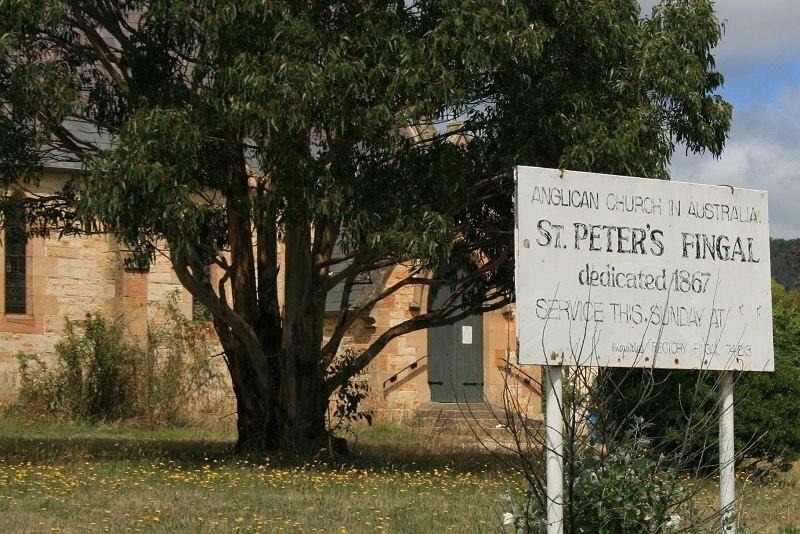 I believe it to be now closed as part of the Parish owing to the decline in parishioners. To my knowledge a key to the church is available at the Fingal Community Centre for anyone to visit. There are so mny beautiful memorials inside. I missed your comment. Sorry! Do you mind if I include this in the main post? No. By all means. Sorry to have not read your request earlier. On the 26thNov. I sadly attended the closing service of the church. It was quite emotional for me and others who did attend. Another era in our lives gone.